5/18 Cup of Coffee: While it was a tough night for the major league club, Tuesday was a successful night on the farm, with all three teams in action coming away victorious. Andrew Benintendi delivered the tying and go-ahead runs with his first two Double-A hits in a Portland win. Pawtucket walked off in the 14th, while a trio of hurlers led Greenville. It took a marathon effort for the PawSox to come away with the win. After Norfolk took a 4-3 lead in the top of the 10th, the PawSox evened the score with a wild rally in the bottom of the frame. Justin Maxwell delivered a one-out double, sending Jantzen Witte to third and putting the winning run in scoring position. Allen Craig followed with a grounder to first, with the Tides retiring Witte at the plate. Down to their final out, a wild pitch scored Maxwell to even the score. The game remained tied for four more innings, until Rusney Castillo delivered an RBI base hit, scoring Deven Marrero with one out in the bottom of the 14th. The hit capped a strong game for Castillo, who went 3 for 7 with a run scored and an RBI. Ryan LaMarre had three hits of his own, including a two-run fifth-inning homer off old friend Joe Gunkel (BAL). William Cuevas got the start, allowing three runs on seven hits in six innings. He walked two, struck out two, and surrendered two home runs. Kyle Martin was outstanding in relief, striking out six against only one walk and two hits in three innings. Pat Light followed, giving up a run on one hit in two innings. Three scoreless innings with three strikeouts gave Robby Scott the win and lowered his ERA to 2.08. After going 0 for 4 in his Double-A debut on Monday night, Andrew Benintendi bounced back to key Portland's win. The 21-year old ripped an RBI base hit in the third inning to even the score at one, then put the Sea Dogs in the lead for good with a fifth-inning RBI double. Benintendi also scored a run and walked. Tzu-Wei Lin scored two runs as part of a 2-for-3 night, while Nate Freiman drove in a pair. Sean Coyle, who started the night mired in a 2-for-40 drought across two levels, showed signs of getting on track with a double, walk, and run scored. Veteran right-hander Keith Couch (pictured) turned in another excellent start, allowing a run on six hits in eight innings. He walked three and struck out three, lowering his ERA to 1.78 between Portland and Pawtucket. Steady rain in North Carolina postponed Tuesday's contest between the Carolina League's two division leaders. It will be made up as part of a doubleheader on Wednesday at 5:15. It has been a strong introduction to full-season baseball for Roniel Raudes, who was solid again for the Drive. He allowed only one run on three hits in five innings, striking out four against two walks. Raudes, 18, has allowed one run or fewer in five of his seven starts. He retired the final seven batters he faced, at one point striking out four in a row. Jake Cosart followed, allowing a run in his two innings of relief. Bobby Poyner wrapped up the win with his eighth save, striking out three in two perfect innings to lower his ERA to 0.45. Trent Kemp delivered the big blow at the plate, a three-run homer in the second inning. It was Kemp's third blast of the season and his first since April 16. Joseph Monge added a pair of hits, including a double. He now is riding a modest six-game hitting streak. 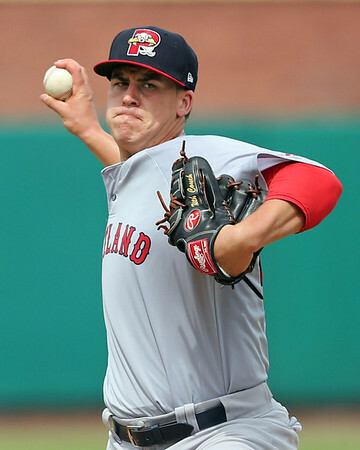 Player of the Day: Now in his seventh season in the Red Sox system, pitcher Keith Couch has turned into one of the organization's workhorses. The 2010 13th-round pick made his 151st appearance, getting the win for Portland with eight strong innings. Couch has bounced between Portland and Triple-A Pawtucket this season. He has allowed only two runs in 20 innings in his three starts for the Sea Dogs.